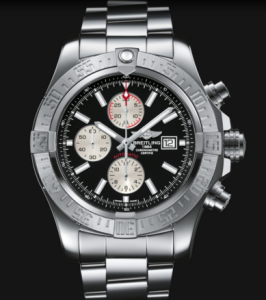 Breitling is a Swiss watchmaker that designs, engineers, manufactures, and distributes chronometer watches. 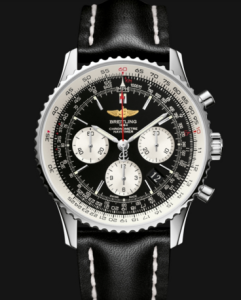 Breitling offers a variety of watches with different designs and functions, many of which are especially useful to aviators. With Big Apple Buddy’s personal shopping service, you can now buy direct from the USA Breitling online store anytime, anywhere. 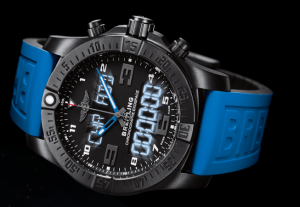 The Breitling Exospace B55 Smartwatch is the perfect accessory for men of action. This watch stands out from others on the market with its technical design and light but sturdy titanium case. It comes equipped with many different functionalities, including the ability to count down/up, connect with your smartphone and deliver your notifications to the watch, simultaneously manage two different time zones, and much more. The TwinPro strap is available in three different color combinations, so you can choose which look is best for you! The Breitling Navitimer 01 is a favorite of pilots and dedicated aeronautical enthusiasts. With its steel case and black dial with red seconds hands, this watch is sleek and revolutionary in both its style and functionality. The bidirectional ratcheted rotating bezel ensures smooth and easy handling of the famous circular aviation slide rule. Even with technology advanced enough for pilots, this watch still maintains a classic and stylish appearance, making it an appropriate accessory for your average work day as well. If you want to multitask and manage your challenges like a pro, then the Breitling Super Avenger II is the watch for you. Its steel case is water resistant up to 300 m and its rugged construction will keep the watch safe and protected no matter what you might put it through. Its solid and technical construction makes it an extremely functional and versatile watch, but it maintains its sleek and timeless appearance. Unfortunately, the USA Breitling online store does not currently offer international shipping. However, Big Apple Buddy, your personal shopper, can help you buy products direct from the official USA Breitling online store and ship them to your doorstep, no matter where you are in the world. We offer international shipping to over 190 countries including Australia, Austria, Bahrain, Belgium, Bosnia & Herzegovnia, Brazil, Brunei, Canada, China, Croatia, Cyprus, Denmark, Estonia, Finland, France, Germany, Hong Kong, Hungary, India, Indonesia, Ireland, Israel, Italy, Japan, Kenya, Kuwait, Lithuania, Macau, Malaysia, Maldives, Mexico, Namibia, Netherlands, New Zealand, Norway, Oman, Pakistan, Philippines, Portugal, Saudi Arabia, Scotland, Serbia, Singapore, Slovenia, South Africa, South Korea, Spain, Sri Lanka, Sweden, Switzerland, Taiwan, Tanzania, Thailand, UAE, UK and Ukraine. If you would like to buy from the USA Breitling online store, simply let us know which items you would like to order (by filling out the form on the right) and we’ll get back to you with a free international shipping quote within 24 hours!